(Bloomberg) — In Venezuela’s gold capital, national guardsmen block the roads. Military convoys and motorcycles circle while soldiers keep wary watch behind sandbag checkpoints or patrol with faces covered by balaclavas and rifles in hand. The military has been fighting for months to master El Callao, the dangerous nation’s most dangerous town, and a beachhead in efforts to develop a mineral-rich region the government calls the Arco Minero del Orinoco. President Nicolas Maduro granted the army the handsome prize, a move that helps ensure the unpopular autocrat’s power. But the takeover has been punctuated by blood and bullets as soldiers raid neighborhoods and clandestine mines across 70,000 square miles from Colombia to Guyana, asserting themselves over gang lords and claiming revenue both legal and illicit. On Feb. 10, the army seized weapons, burned vehicles and killed 18 civilians — including a woman and a youth — in one of the deadliest clashes since the project’s inception. Many victims were shot in the head and face, according to police photos and death certificates obtained by Bloomberg. Soldiers “know that they can benefit from the uniform they’re wearing,” said Miguel Linares, 31, a trucker who ran gasoline to mines — and whose 34-year-old brother, Tigue, and close friend Carlos Alfredo Brito were among the dead. Maduro faces a May 20 election with support from only about a fifth of the population and he is turning over swathes of the economy to the 160,000-member military, the strongest power in a failing state. Active and retired officers hold 14 of 32 cabinet posts. Soldiers have replaced many of the 80 state oil company leaders whom Maduro has imprisoned since August. The ports have been militarized and the Defense Ministry oversees the hungry nation’s food supply. The Arco Minero is another lucrative franchise granted by Maduro. Maduro has promoted hundreds of officers since he became president in 2013 — there are now some 1,300 generals and admirals. High-ranking members of the military control legitimate industries, black markets and the nation’s security, creating a “perverse relationship,” said Diego Moya-Ocampos, an Americas analyst at IHS Markit, a London consultant. In El Callao, years of dwindling oil revenue and failed statist policies have the government craving gold deposits it claims total as many as 8,000 tons, which would be the world’s second-largest behind Australia. The Arco Minero produced 8.5 tons in 2017, while Maduro hopes to raise production to 24 tons by year-end, according to mining minister Victor Cano. Venezuela needs it desperately. The nation's gross domestic product is projected to fall about 15 percent this year, according to the International Monetary Fund, a cumulative drop of almost half in five years. 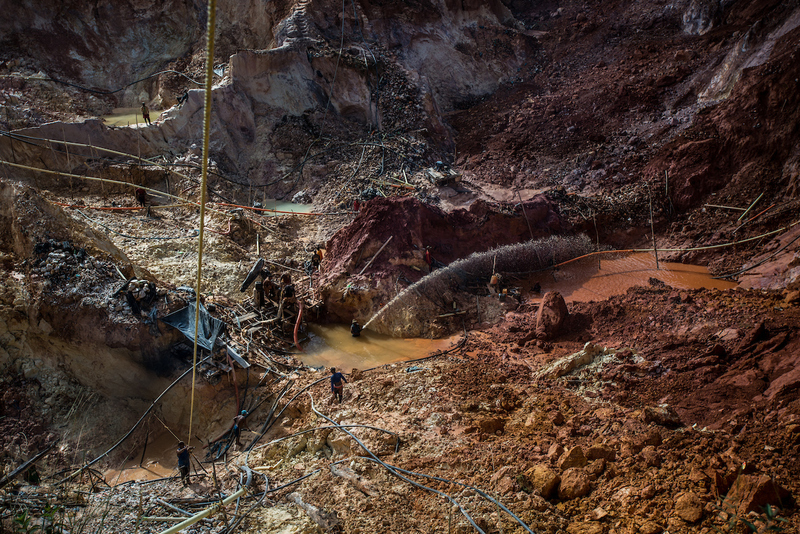 Gold processing ground to a halt amid neglect and mismanagement after late President Hugo Chavez nationalized the industry in 2011, and gangs imposed themselves over illegal miners who descended by the thousands. Official production fell to a single ton in 2016, according to the CPM Group, a commodities researcher. But that year, Maduro granted the armed forces wide-ranging security powers and let them create a company that would provide mining services. He invited 150 companies to exploit diamonds, gold and coltan in the region, but few partners materialized. Now, shootouts regularly erupt among soldiers and rival gangs. The miners are extorted by all sides, but still they flock to muddy pits and hand-dug shafts to pick and pan. In a gang-run mine tunnel hundreds of feet below the outskirts of El Callao, Gregorio Aguilar was working a 36-hour shift lugging sacks of rocks and rust-colored soil. Weeks earlier, he had been bagging what few groceries there were in nearby Puerto Ordaz. Many don’t. El Callao last year ranked as the country’s most-violent municipality, according to the Venezuelan Violence Observatory, which estimated a homicide rate of 816 per 100,000 residents. El Callao sits amid mountainous jungle along the Yuruari River, and gold brokers, jewelry and tool shops line its thoroughfares. Paved roads quickly give way to dirt tracks, where makeshift camps and tarp-covered tunnels are around every bend. Businesses cater to miners: Open-air bars stocked with cold beer are within walking distance of the pits, stacks of speakers blare salsa music and prostitutes ply the streets. In a country where cash is scarce, residents carry brick-sized wads of bills to bodegas and markets that offer meats, milk and imported pasta. At the apex of this isolated economy sits the national guard. The force manages the flow of gasoline for generators and water pumps, and controls commerce. In the almost 120 mile (190 kilometer) drive from Puerto Ordaz to El Callao, there are more than a half-dozen military and police checkpoints. Low-ranking soldiers shake down individual miners and smugglers, while officers extract tributes from armed groups for the right to do business. Those gangs in turn extort anyone wishing to work. Then, there’s the official business: The Venezuelan central bank purchases gold in El Callao from select brokers, mill associations and groups of registered miners, dubbed “mining brigades.” State gold processor Minerven melts the ore into bars, which military aircraft take to airbases around Caracas. Soldiers unload the riches into armored vehicles bound for the central bank. When the gold arrives in Caracas, it is presented — sometimes to Maduro himself — in ceremonies broadcast on state television. The president, who has said he plans to launch a bullion-backed cryptocurrency, was shown kissing a bar with his eyes shut. Such ardor belies the brutal struggle in the Arco Minero. Over the past year, local news outlets have reported dozens of killings by state forces in El Callao and surrounding areas. The Feb. 10 army raid that killed the civilians happened at a mine called Cicapra, about 25 miles from El Callao, according to a military communique seen by Bloomberg. Carlos Alfredo Brito, 27, had recently begun delivering gasoline to wildcatters along with the Linares brothers. He had been making a pittance hauling vegetables, livestock and furniture but needed money to buy epilepsy medicine for his mother. “I begged him to just go to Peru just like all the other young people in Venezuela,” said his mother, Petra Rodriguez, a 52-year-old from the small town of Soledad. Brito’s last trip was a gamble, said Miguel Linares, who negotiated the deal with a gang leader for 20 barrels but returned home before the attack. The group of six would be paid in gold. They traveled in an SUV and two trucks, stopping repeatedly to repair a balky clutch and selling some of the gasoline to buy parts. Brito’s mother last heard from her son Feb. 8. She had texted Brito to let him know she had managed to find 11 boxes of medicine and hoped God would watch over him. The group stayed at the mine after night fell Feb. 9, surrendering their cell phones to the gangsters. The army arrived in the small hours. After the violence, soldiers recovered assault rifles, pistols and grenades, according to the internal communique, which didn’t explain why the army came to the mine. It said the victims were resisting authority, but the families insist they were slaughtered. A Ministry of Defense spokeswoman declined to comment on the killings. “They’re not going to make any statement, and there are no statements on the matter,” Kariandre Rincon said. On Saturday, Feb. 10, Brito’s mother texted him, “God bless you, son! How are you? What are you doing?” No reply. The family heard of his death later that day. By then, the army had delivered his body to a police station in southern Bolivar state, victims’ relatives said. From there, the remains were taken to an overheated morgue near Puerto Ordaz, where families came to collect them. The naked corpses were stacked head to toe on metal trays, with numbers taped to their chests. Brito had been shot repeatedly in the chest. His family buried him that Monday in Soledad. The date was written with a finger on his concrete slab.